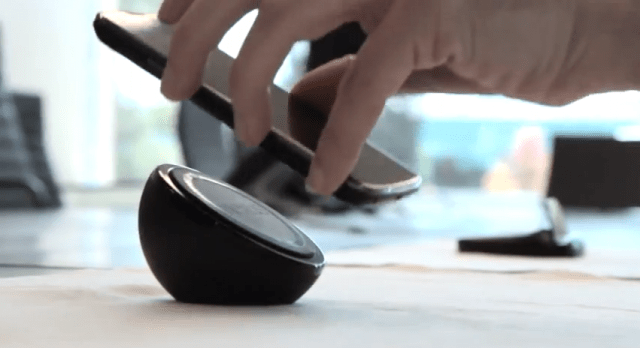 One of the big features of the new Google Nexus 4 smartphone is support for wireless charging, and so alongside the phone Google is releasing the aptly-named Wireless Charging Orb. Shaped like a sphere sliced crosswise, it bears more than a passing resemblance to Palm’s Touchstone. The face of the dock is set at an angle so you can easily see the phone, and it’s finished with a soft-touch plastic that should ensure that it won’t mar the glass back of the Nexus 4. Google tells us that it’s using the Qi wireless charging standard, so charging pads designed for Nokia’s Lumia phones should also work on the Nexus 4. Google’s Wireless Charging Orb takes inspiration from the Touchstone in several other ways. As mentioned above, the phone sits at an angle on the dock — a feature that only works because both the dock and the Nexus 4 have magnets inside them — just like Palm Pre phones. You can orient the phone in either portrait or landscape as well. The other major feature Google borrowed from Palm is a feature in Android 4.2 called “Daydream.” It displays photos, news from Google Currents, or other information when the phone is docked. That same feature was available on webOS, then called Exhibition. Whatever the source of ideas may be, it will make the Nexus 4 a little more useful as it’s charging on your desk. We’re still waiting on the official price and release date for the dock, and will update you when we hear more.